In recent times, the USA has a bad press when it comes to world opinion. As ever, the actions of the “few” – those in charge of foreign policy – has created a backlash of bad feeling towards the “many” – ordinary Americans just trying to get on with their lives. America, it seems, is like Marmite. But whether you love the place with a passion or hate it and all it stands for, there is no denying the huge cultural impact the United States has made on life in Great Britain since the end of WW2. Opinion varies as to whether this is a good thing or not, but what follows is my personal viewpoint. As a writer, people often ask me why, as an Englishman, my stories contain so many references to American culture. Well, you could say I had no choice in the matter! Despite growing up in the backwater of a small market town in rural Herefordshire, I’ve been around Americans all my life. I was born in 1962 and my g-g-generation was (I think) probably the first to be subjected daily to the American way of life without ever having to leave British shores. In the early 1960’s, television technology advanced and TV sets became accessible to more and more UK households; the numbers of channels and programmes increased and TV influences from across the pond came thick and fast. As a result of this, I, like everyone else in my age-group, grew up with American as a second language, absorbing an influence that reflects strongly in my writing. My earliest memories are of watching John Wayne movies on our old black and white TV and then playing cowboys and indians (I always wanted to be Geronimo, leader of the Apaches). I watched Neil Armstrong step onto the moon and news reports of the Vietnam war. There were countless US TV shows: Bonanza, Kojak, Starsky and Hutch, The Rockford Files, M*A*S*H, Taxi and many more. When I began to take an interest in music I learned that blues men from the 1930’s inspired the Beatles, the Rolling Stones (also in their 50th year), Led Zeppelin and other British bands who took this music back to America to a white audience who were largely unaware of their own musical heritage. American movies introduced me to classic American cars: Steve McQueen’s 1969 Ford Mustang (Bullitt), Gene Hackman’s 1971 Pontiac Le Mans (The French Connection), Jim Rockford’s Pontiac Firebird and Barry Newman’s Dodge Challenger (Vanishing Point). Well, if that’s true then my soul is alive and well and my love affair reignited with a recent tour around Memphis in a 1955 Cadillac (more of that to come). So, American influence – good thing or bad thing? Well, my personal view is that I’m British and proud to be so, but I can also speak American, because I grew up with it. At the end of the day we are all just people. These words from an American made me proud to be British. Oh, and I love Marmite. 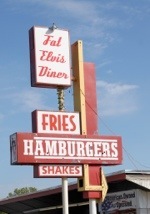 Evel Knievel and The Fat Elvis Diner is available on a Kindle near you!